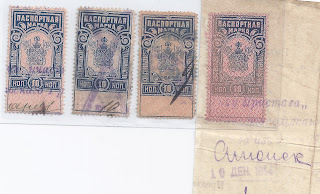 These Passport Fee stamps used at Sevastopol are quite common. 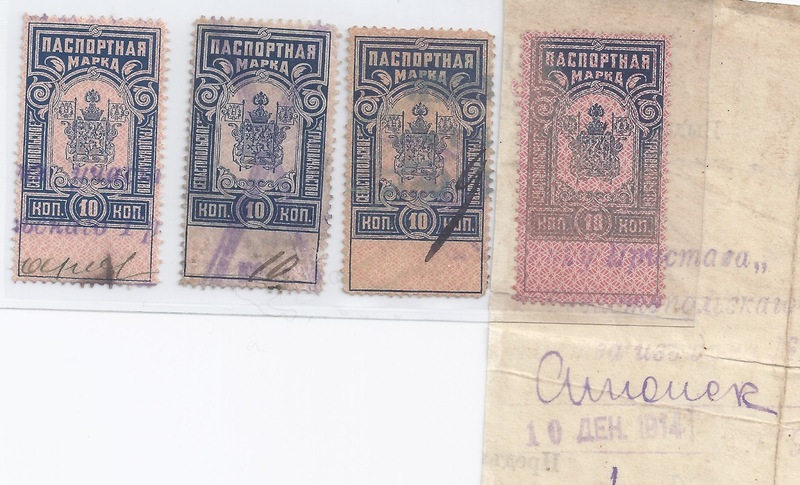 The Barefoot catalogue says they were issued in 1907 (replacing an 1898 issue which is scarce or rare) and I guess they were used up until 1917 - the stamp on the right on a fragment shows a date of use 1914. It is this right hand stamp which puzzles me. Click on the image to enlarge it. When I click, it looks to me as if the rose / pink coloured underprint has been printed on top of the blue design. But if so the print is not even - the shield at top with the words PASSPORT STAMP looks more or less normal. So it may be that this stamp has been affected by sun light or water ( but I cannot see any water damage on the back of the fragment). Or it could be that the underprint was designed to leave the top shield area more or less clear. Does anyone have another example? Does anyone have an explanation? Please use Comments below if you have any ideas!